Yesterday, I deleted my EA Origin account, because I was fed up with how things were “going according to plan.” EA’s and other forced online game portals plan seems to be two fold: 1) require players to login to a service to play a local-instance, single-player video game, and 2) waste as much time and bandwidth resources of players as possible in the function of updating the front end portal and the games accessed via the portal by denying users the choice to update if and when they choose to do so. The straw that broke the camel’s back for me was the above message from EA–“it’s all going according to plan” and the unending “preparing” to download a very large, required update for Star Wars: Battlefront II. Finding a few free minutes before bed, I wanted to fly the Millennium Falcon through the wreckage of blasted cruisers and obliterate as many TIE Fighters as possible. I play against computer-controlled adversaries. I don’t play against other players over the Internet. Everything regarding my game play experience takes place locally on my PC. Nevertheless, EA requires me to login to Origin before playing Star Wars: Battlefront II. Before logging in, Origin required a software update. I did this. Since I hadn’t logged in for a few months, I had forgotten my password. I had to reset it. I logged in. Then, Origin required a large update to Star Wars: Battlefront II before I could play the game. I waited. I waited some more. I only wanted to play the game for about 10 minutes before bed time. Now, I had invested about 20 minutes on updating software and resetting passwords. While it was “preparing to update” as seen above, I began researching how to delete my EA Origin account. I discovered that they make this as difficult as possible. You have to chat with a representative instead of clicking a link after logging into your account. I began doing this while still Origin was still “preparing.” The representative, who was nice enough, followed his script to try to dissuade me from deleting my account and instead deactivate it. I persisted with deletion and after another 10 minutes, I was told that it would take some additional time to delete my account but I didn’t need to stay on the chat while this was done. I simply don’t like having to login to a service to play a game–especially when logging in might involve downloading gigabytes of installation updates. I understand why EA and other game publishers do this, but I don’t want to have to do this. I should be able to launch the game that I want to play and just play it. So, I wanted to delete my account and give up on EA Origin and Star Wars Battlefront II. I’ll seek out those games that let me play them on my terms. I am vociferously against the shift to enforced online-only gaming for games that have a single-player mode. Games should be able to be enjoyed locally without hindrance if there is a single-player mode built into the game as there is with Star Wars: Battlefront II. Of course, I understand the need to login to a service when the game is enjoyed in multiplayer mode, but not all players opt for this kind of game play experience. Some of us enjoy playing the various single-player experiences within the game. I purchased the game when it was on sale, so I will consider the money that I spent on it already invested in the times that I was able to fly the Millennium Falcon through the blasted wrecks of space battles. However, I will never purchase another single-player option game from EA or any other video game publisher that doesn’t give me a modicum of respect to enjoy the game on my terms–no logging into online services (if I’m not playing against others online, I don’t need to login) and no required updates (I should be able to choose how and when I update the software on my computer). I encourage others to avoid these games and seek out those made by publishers who respect players who value single-player game experiences. As a final note, I was saddened to hear that Disney CEO Bob Iger signaled the company’s happiness with EA’s work with the licensed Star Wars intellectual property, even after the debacles with the launch of Star Wars: Battlefront II and my own frustrations with the game. I wish that Disney would partner with a company that puts customers/players first–both in terms of game play experiences and respect of the player’s approach to gaming and software maintenance. Why and What is DynamicSubspace.net? Plus, Site Updates. I began dynamicsubspace.net as a mac.com blog a few days after I landed in England and arrived in Liverpool in 2006 for two reasons: 1) I wanted to record my adventures in England for myself and my friends, and 2) I wanted to improve my writing and argumentation through regular practice. So, you will find a mixture of personal and professional; lighthearted and serious; World of Warcraft and politics; and Lego and science fiction. This blog has evolved over time, and I am sure that it will transform further as time passes and I, as its author, change as an individual, a professional, and a writer. The single unifying thread that runs through all the blog posts on dynamicsubspace.net is that it is all an expression of myself or an extension of my interests. Some posts are personal reflections, other posts are critical reviews, and yet other posts are reminders or helpful messages for the science fiction community. You will many find posts related to the SFRA, because the organization and its members are very dear to me as friends and colleagues who helped guide me to where I am now. The above writing was originally on the “About” page of dynamicsubspace.net. I have recently been expanding some of the site’s static pages to include a section on “Teaching” and a revamped “About” page. In particular, I wanted to augment my writing with images. I wanted my blog to express the same multimodality that my students are developing now. I expect to make a few more additions in the next few days, so please stay tuned. I have eight minutes to midnight, and I need to get a post loaded for today. It has been a busy day catching up on other things now that have I finished a writing assignment for an encyclopedia. Since I don’t have much time, I will say that I have some cool posts planned for later this week that highlight some of my going-ons lately: baseball upgrades, hard drive upgrades, memory upgrades, Lego upgrades, and more upgrades. Okay, so not everything is about upgrades, but it will be fun news nonetheless. Five minutes to midnight now . . . See you tomorrow. It has been long overdue, but I finally got around to rewriting the About page on dynamicsubspace.net so that it accurately reflects what I have done in the past and what I am doing now. Some of the material on the old about page was far too old and patched together. I hope that the new page creates a better narrative of how I got to be where I am now and what I have been doing along the way. I also added a new section that is specifically about the blog. You can find them on the “About” link above, or go here. While I was making these changes, I decided to switch from a PDF version of my CV linked from the About page to a separate page that has a copy of my CV directly on the site. I think it is just as easily readable on there, and it makes it easier to find the work that I have done. You can find the CV page on the link above, or go here. 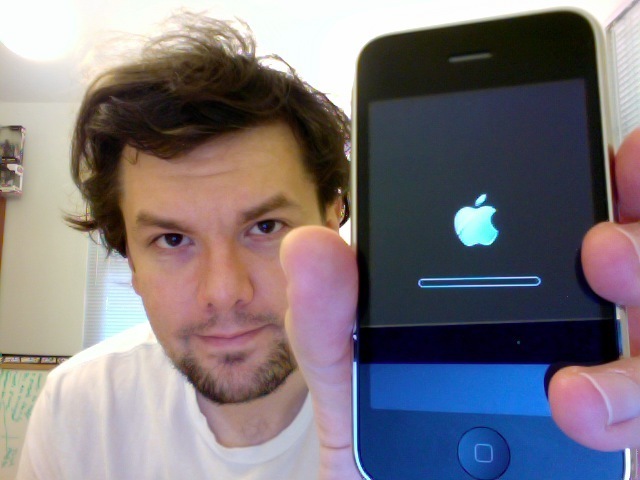 I left iTunes downloading iOS 4 while I was running errands. Now, it is installing. Other updates: Waiting on a very important fax. Dropped off book for Dawn at the post office. Talked to Dave for a minute outside SFH–he’s out of the hospital and taking it easy.